Just back from Bike Trip, It's always inspiring... In the last minutes, I've written a quick Qt Line Graph demo that maybe I'll use in the my next Project, if I find a bit of time. 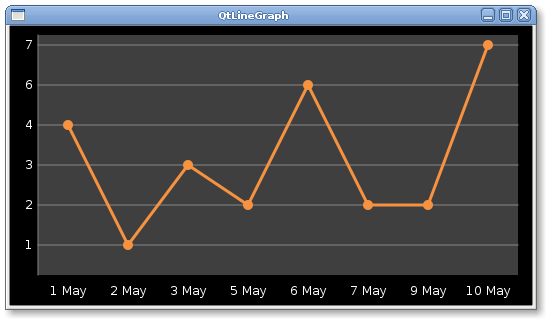 The Source code is available here: Qt4 Line Graph Source Code. Merci ton code marche bien!!! J'ai rajouté des lignes verticales!!! Thanks for your code. It works well!!! Thanks man! works like a charm! Thanks you ! awesome ! Do you have a code for bar graph ? Bernardo The Smallest HTTPD Ever! Matteo Bertozzi 2004-2012. Powered by Blogger.